Ski touring pants must be flexible to enable you to take a full stride when skinning and bend easily when booting through snow. Breathability is a must so you don't start sweating and then get cold. Get a good-fitting pant that you won't trip over while wearing crampons and is comfortable enough to wear all day long. Leave it to Dynafit to make the ultimate race-training and spring-touring pant. The Mezzalama Race Pant is a top-tier mix of 4-way stretch Carvico and Dyna-Shell Windproof materials that’s abrasion-resistant, water-repellent, warm, and impressively breathable. The lightweight Carvico material takes up the back of the back of the pant to vent excess heat, keeping the internal climat.. Recent studies show that owners of Karpos pants have a higher quality of life. This is especially true for skiers that own the Alagna Lite Pant. Such folk are often found alone at the top of peaks or passing people in the wee-hours of a resort-skinning session. The front half of the Alagna pant is made from K-Shell, a Karpos fabric that stops wind in its tracks. The back half of th.. The Women’s Touring Intense Pant from Millet is designed for high-level ski touring and competition. Like the matching Jacket, the technical pant is a close sporty fit with stretch fabric and a desire to move up and down mountains fast. Millet added stirrups to the pant to go over your ski boots, with special cutouts through which you can operate your buckles. The cuffs are reinfor.. Together with the Jacket, the Falls Pant is a high-performance racing and training suit that will keep you energized when skiing up and downhill. That’s both due to the magic PowerKler fabric and the overall efficient design. The fabric-makers claim the fibers can reflect body heat in a way that affects muscle performance. We’re not sure but we know when you put one of these on you.. The La Sportiva Devotion is a high-performance training pant for uphill skiing. It features a 4-way stretch fabric that provides a tight-yet-flexible fit. The cuffs are reinforced with scuff guards and has zips to get them over your ski boots. The rear back pocket is a nice touch if you like to train in safe zones without avy gear and backpacks, since you can stash a card or key. T.. Warm, stretchy, comfortable, and high-performance; what’s not to like? The Alagna is the staple high-speed touring pant from Karpos; popular for good reason. Thermodrytex Double, the mainstay fabric in the Alagna, is very breathable and sports a DWR finish. That means it will vent and repel water with aplomb so you can charge through splitter weather. Thermodrytex PL+, a similar fa.. If you like comfortable ski-touring pants from companies focused on sustainability, Ortovox’s Tofana may be the champion. The cut is athletic and it offers just enough room for layering to the conditions while still staying streamlined to avoid crampons and ski-edges. But what really separates the Tofana is the 100% Tasmanian Wool lining. Wool is a sweat-wicking, stink-busting, and.. The women’s version of the Pierra Ment’ is much the same as the highly regarded men’s pant. It’s an active pant that allows you to move freely in the mountains. Designed for ski touring and other up-tempo pursuits, the Pierra Menta provides just the right amount of protection and warmth for the active woman. It has a feminine cut with articulating knees, making it a well-fitting wi..
Women no longer have to shop in the men’s department for this. The PDG is a popular skimo pant since it’s a stretchy softshell with wind-blocker sewn in the front. That means it moves and breathes on the uphill yet doesn’t give you the shakes on the down. The PDG pants have stirrups that go under your ski boots and a reinforced cuff area for cutting out buckle holes. This makes tra.. Together with the jacket, the Syborg Racing Pant from La Sportiva offers an athletic fit with excellent climate control. The stretchy, body hugging fabric enables fluid movement while you’re playing in the mountains. It’s designed to stay out of your way, reducing snagging on crampons, ice axes, and boot buckles. The cuffs are specifically designed for popular boots with reinforced.. The Sideral pant for women is a comfortable all-around mountain pant that you will want to ski in every day. Made with Crazy Endurance fabric that is stretchy and breathable, the Sideral pants are great for earning your turns. The fit is athletic and you can cinch the drawstring on the waist for a snug hold. A stylish polyurethane reinforcement pattern is heat-bonded to the cuffs f.. If there is one product that epitomizes Dynafit’s approach to the mountains, it is the TLT 2 pant. Ready to adapt to whatever you throw at it, the TLT 2 Women’s Pant is another top-notch product from Dynafit. Trim but not restrictive. Warm enough for cold weather skiing, but not too insulated to take out in the spring. Enough water-repellency to keep you dry while still exceeding b.. Protective, breathable, and stretchy: just how all pants should be. The Speedfit Dynastretch Pant is built with a body-mapping design called Hybrid Construction which maximizes weatherproofing without sacrificing mobility. Dynafit accomplished this by splitting the pants into a front and back half which are controlled by your left and right brain, respectively. The front half is bu.. The Cervino pants have a sleek feel on the outside and has a soft fleece lining within. One of the most comfortable ski pants around, the Cervino is optimized for speed. The Vuelta knit is stretchy and nearly friction-free. The cuffs are zippered to get around your boots, and have cutout zones for popular two-buckle boots. This means no messing with your cuffs during transitions, j..
Thankfully Dynafit didn’t leave women out when it came to the new signature pant. Designed to be fast and light, the TLT Pant is for women that like to get things done in the backcountry. The pant doesn’t have a water-trapping membrane so it remains breathable. Instead is uses a double weave construction to achieve the goals of water-repellency and wind-resistance. It also features.. The B-Side is the women’s version of the Century pant. That should be enough of a description but we’ll continue. The B-Side is an all-round mountain pant that is excellent for ski mountaineering and touring. With cuff reinforcements that extend up through the knees, the pants are ready for an uphill fight. The Magic Silver yarn fights bacteria which prevents odors. It’s woven into.. The streamlined Mercury 2 Pant is now even more appropriate for active ski touring. The brushed lining is woven into the shell to give a sleek feel. This, coupled with an updated mix of materials, enables the pants to be several ounces lighter than the original Mercury from Dynafit. The pants are still designed for daily use, with an abrasion-resistant weave and durable scuff guard..
Karpos’ has a long tradition in fashion-centric Italy, and once you wear the Express 300, you’ll realize why the company’s reputation is so strong. The pants sport a DWR finish from top to bottom that will readily repel dirt and water, meaning you’ll be clean and dry. The main panels on the Express 300 are K-Stretch, a breathable two-way-stretch fabric that can stand up to bad weat..
Millet categorizes the Touring Shield Pant as an "action shell" for a reason. Built with Polartec® Powershield Light and Stretch three layer fabric, the pants are cut ergonomically and have articulated knees to move with your body. And since they are specifically designed for ski mountaineering, the Touring Shield Pant focuses on breathability so you don't become waterlogged on lon..
Advance your ski adventures with the Crazy Idea Advanced pants. Built for both uphill and downhill skiing, the pants are constructed with Polartec Windbloc® fabric, meaning they can handle both harsh approaches and extreme descents. The material is stretchy and the fit is performant, which means not-baggy. The waist is adjustable with Velcro and the cuffs have an internal gaiter to.. The quality and attention to detail that Karpos presents is almost unmatched, which is why the versatile Mountain pant is one of the mainstays of their lineup. Sporting a top-to-bottom DWR finish, the Mountain pant will repel water, dirt, and other contaminants which means your pants stay clean and breathable. The main fabric used is K-Shell, a lightly insulated and breathable wind.. The lightest and most breathable insulation available make this the most functional skirt available. Warm-up, race, cool down, and just hang out in the Dynafit Mezzalama Alpha Skirt. Zip it on over a race suit or pants with your skis on by using the full length side-zips. The skirt is stretch-woven nylon that is wind-resistant, water-repellent, and abrasion-resistant. 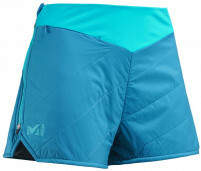 It’s also stu..
Millet’s Pierra Menta Alpha Shorts are a fresh alternative to insulated skirts. 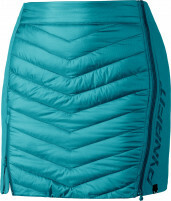 Skirts have been the mainstay removable insulation for fast touring, offering warmth with very little bulk. 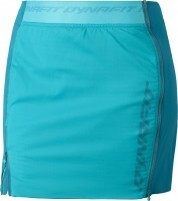 Shorts offer the same benefits but with unlimited range of motion while skinning and booting. Keeping your core warm is the quickest way to boost your overall comfort and, with your pelvis being p..
DWR-treated fabric, Primaloft insulation, and full side-zips aren't generally the first words that you'd think to use when describing a skirt, but thanks to Dynafit’s introduction of the Radical skirt, now we do. The TLT Skirt is an updated version that maintains the charms of the original. The full length side-zipper make it the perfect pre/apres ski apparel. Zip up and warm up. ..
La Sportiva calls the Athena a “tech-fashion” piece. That seems about right, considering the usefulness and wide assortment of colors. In fact, each skirt comes as two colors since the they are reversible*. This doubles your chance of matching while keeping important bits warm. 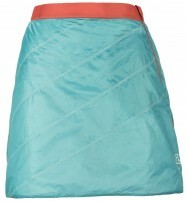 The Athena 2.0 Skirt can be zipped on over ski pants or a base layer, adding a layer of Primaloft® insula.. Simple descriptive name, simple functional pants. The Light Pants from Crazy Idea are a full-length thin-nylon wind pant. With zippers down the side they can be quickly donned over a skin suit or softshell to provide protection from the wind. And at an ultralight weight, they make a great checklist item for a race. The pants have an elastic waist and cuff and can be stowed in a hid.. If you’d like a base layer to turn the warmth up a notch during the depths of winter, but you don’t want to deal with the stink of synthetics, the Women’s Comp Light pant from Ortovox is the place to look. Ultra comfortable against the skin with a seamless circular-knit design that eliminates chafing issues, this is a 3/4 base layer short that easily moves with the body while wicki.. The Women’s Crux is a versatile tight that can be used as an under-layer for skiing or as an only-layer for running. Just the right length to not crowd your calves in a ski boot, the Crux wears nicely under a race suit or touring pant. La Sportiva built the tight with seamless technology to ensure chafe-free comfort. It has a zip pocket in the center back of the waist for carrying ..
Face it, everyone needs a pair of good touring bottoms. If you are looking for a warmer set for those really cold days touring, look no further than the Culotte Cucu’ boyshorts from Crazy Idea. Not only does the Culotte Cucu help keep you warmer, it is made from a silk mix-fiber that wicks moisture away effectively without causing the irritation that wool can sometimes create. You ..